You can't even begin to understand how excited I was when I saw that the forecast was calling for rain! Now normally I'm not a fan of the rain or cold weather. I would be more than thrilled to live in summertime weather year round which is almost what it is like living in Southern California. 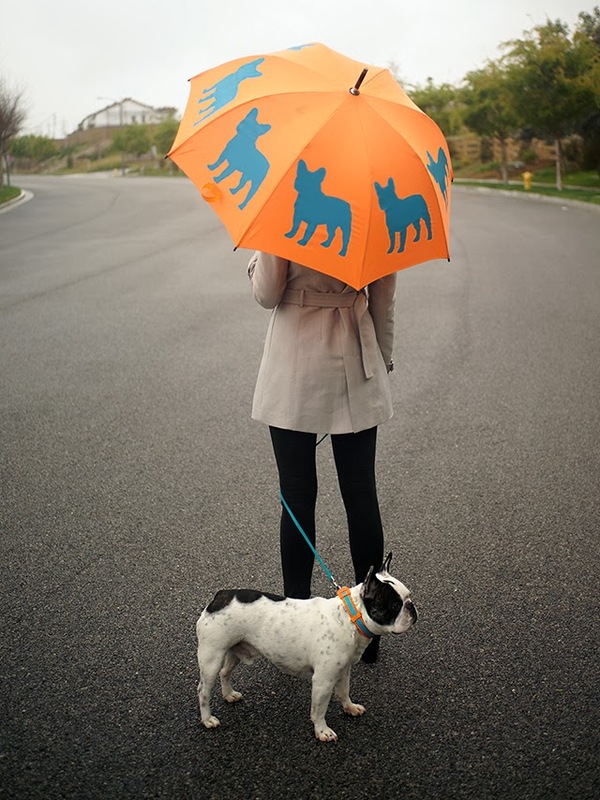 However, I received this beyond adorable French Bulldog umbrella for Christmas and I have been dying to use it since! I did an "OMG this is so cute, OMG I hope it rains" dance when I opened this gift and naturally my dance had the exact opposite effect on the universe. It did not rain the rest of December, all of January or even in February. Luckily, with the beginning of March came some showers. 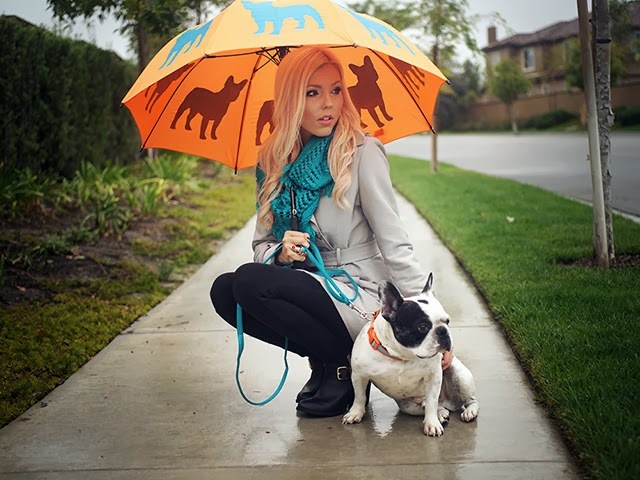 These rain clouds brought some much needed water to California and I finally got to bust open my orange and blue Frenchie umbrella! I carried it around all weekend with pride while I stayed fashionably dry. My Frenchie, Lucky, is the reason behind my obsession with all things related to the French Bulldog breed. I'm like one of those super proud parents who owns coffee cups, and T-shirts, and luggage tags, (and umbrellas) with their child's likeness plastered on them! Guilty. What else can I say? His personality is the coolest and I just love him to pieces. I find it funny that the rain doesn't bother him, at all, ever. It could be pouring outside and he still wants to take his time to walk around and smell everything like he would on a typical sunny day. -Excuse me dude, hurry up and do your business. It's cold out and unlike you I don't want to be soaking wet! 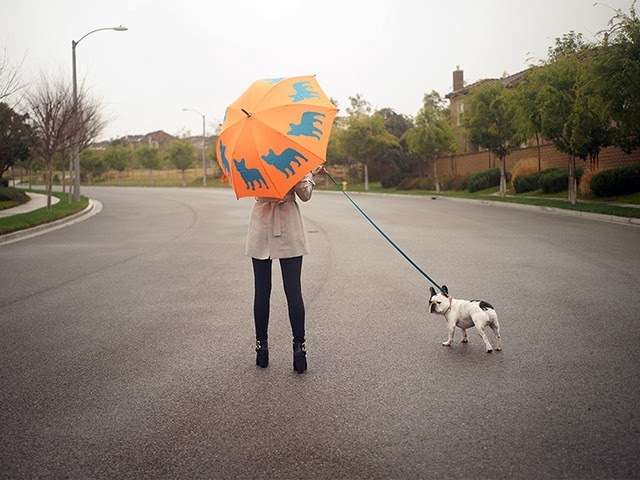 I was so happy when I accidentally found a collar for Lucky that matched my umbrella exactly! To my utter shock it was clearanced out for $1 in the bins near the register at Petco! Umm... score! I did end up paying $14.99 for a matching leash though but my lil man has to be stylin'. This outfit is pretty much a collection of all my current faves. 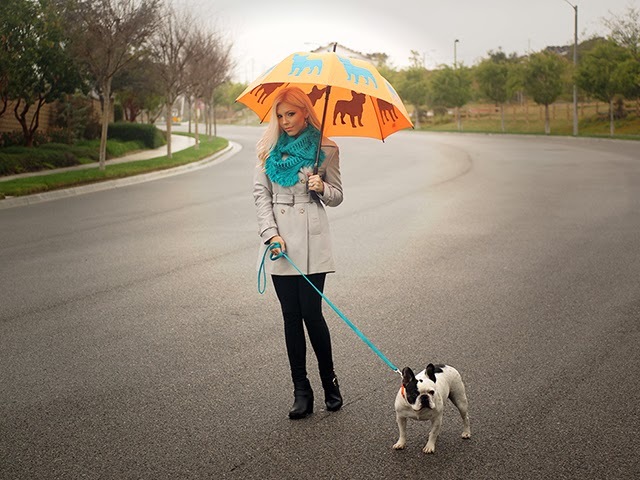 My trench coat by Tart Collections is super comfy and since it is water-resistant it is perfect for rainy days. I love to wear scarves with it because I like the look and it makes me feel extra cozy. My black pants fit like jeggings and I wear them almost weekly. My newest favorite shoes are my black booties that I bought on vacation from the H&M in New Orleans. I love the gold hardware and I can comfortably wear them all day long. Hello! Where do you live in California? 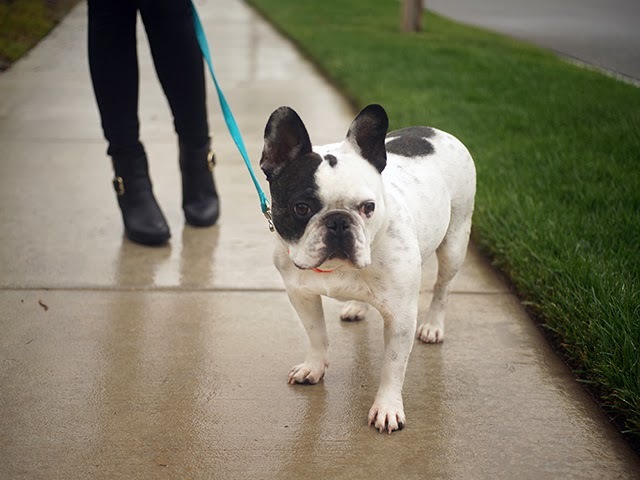 I have an online shop for french bulldogs and i need a model at times. 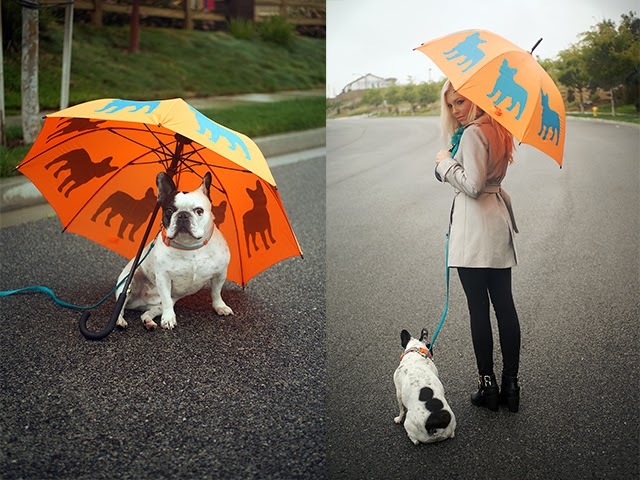 A Frenchie model.. maybe we could collaborate.. www.brunosswag.com check it out and reach out to me! Great pics!